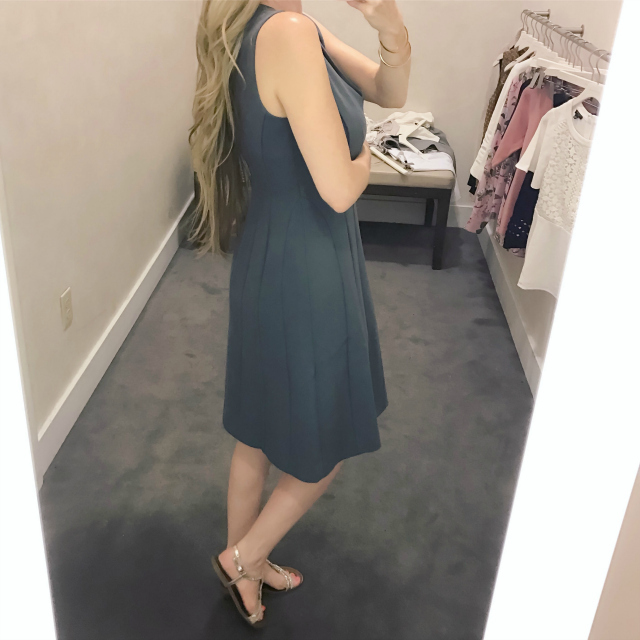 Today I'm sharing some Ann Taylor fitting room reviews with you. Before I get started, I have to share that Ann Taylor is still offering 50% off everything both online and in-store! Use code "FALL50" if shopping online. No code is needed in-store; the discount will be applied automatically at checkout. Sale ends tomorrow night, so you don't want to miss out on your favorite pieces at a great discount! Start shopping the sale here. 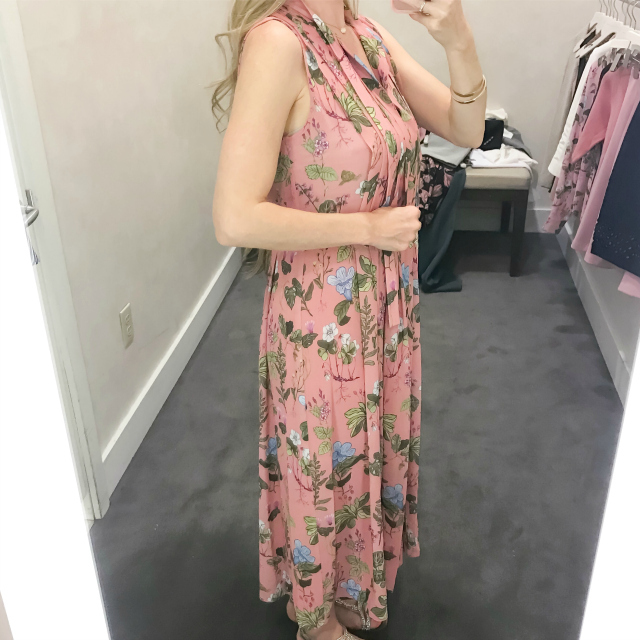 Let's jump into the fitting room reviews! First up is this Botanical Pleated Blouse in "peach blossom." 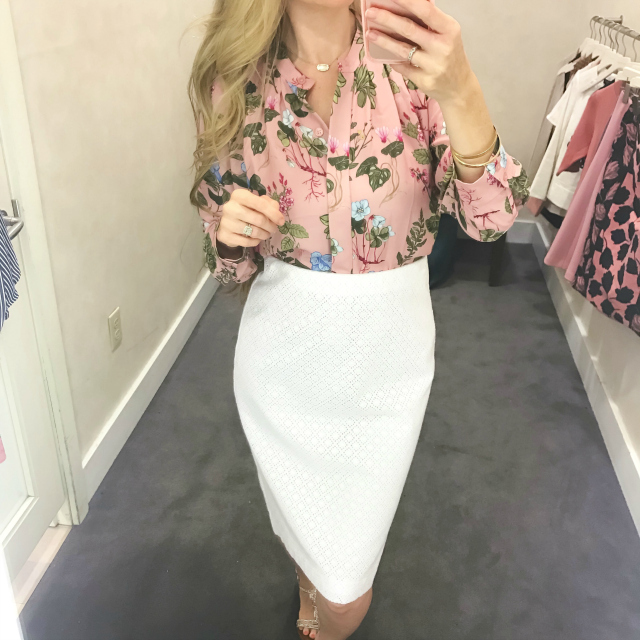 I knew I would love this blouse as soon as I saw it online; the peachy blush and pastel colors combined with the intricate floral print are just so beautiful and feminine. 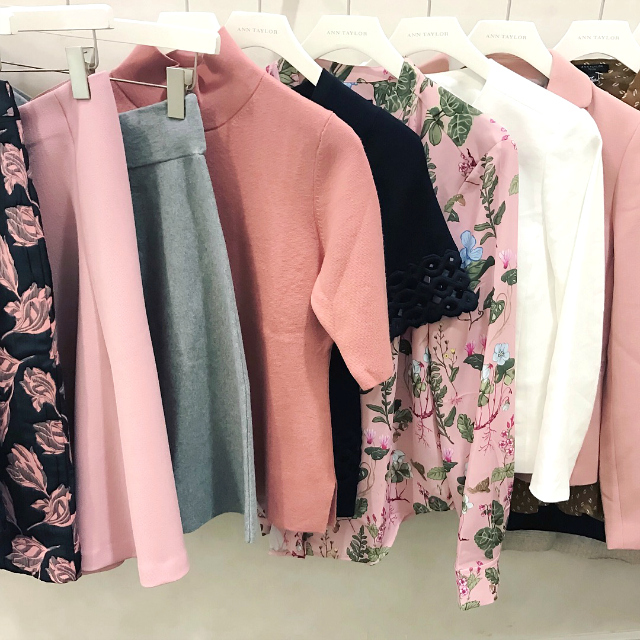 The fabric feels soft and silky, and the long sleeves are ideal for both the office or for after-hours when you just want to slip on some jeans and a pretty blouse and go. Fit: I tried on the smallest size available, XS regular, and I would say it runs large; the fit was wide and blousy un-tucked. It's more manageable when tucked in, though, as you can see here. Unfortunately, this blouse is not offered in petite sizing - boo. I still adore this blouse and would highly recommend it, but a size XXSP would have been ideal. Just know that if you're really petite, you may be looking at alterations, i.e. slimming the sides and possibly shortening the sleeves. Update: Petite options for this blouse were available exclusively online but sold out quickly, which is why I didn't initially see any. However, as of today (10/10/16) size XSP has popped back in stock online, so if this is your size, hurry and snag one before it's gone! This Diamond Eyelet Pencil Skirt is a great option if you're in the market for a creamy-white pencil skirt. It's a little on the thin side, so I would suggest wearing it with a half-slip just to be safe, but overall it's lovely with its eyelet detailing and is a great neutral skirt to have in your wardrobe. I would definitely recommend it. Fit: I tried on size 0 regular, which was the smallest available, and the waist was slightly loose on me. I'd say it runs a tad large and would recommend sizing down. That said, I checked online and it appears that size 0 is the smallest size in stock, which means petite gals may again have to consider alterations, i.e. taking the waist in and having the sides slimmed. Next is this Floral Pleated Midi Dress in the same pretty print. I adore everything about it except for the sizing/length. As you can see, it's extremely loose and the length hits me at the ankles. Unfortunately, the smallest size available for me to try on was a size 4 regular. The petite sizing was not available in the store, which was a big disappointment, but I decided to try this one on anyway to get a feel for it. The fabric is soft and flowy, and the pleat detailing on the front is such a lovely detail. The tie-neck collar is another feminine detail that I love. 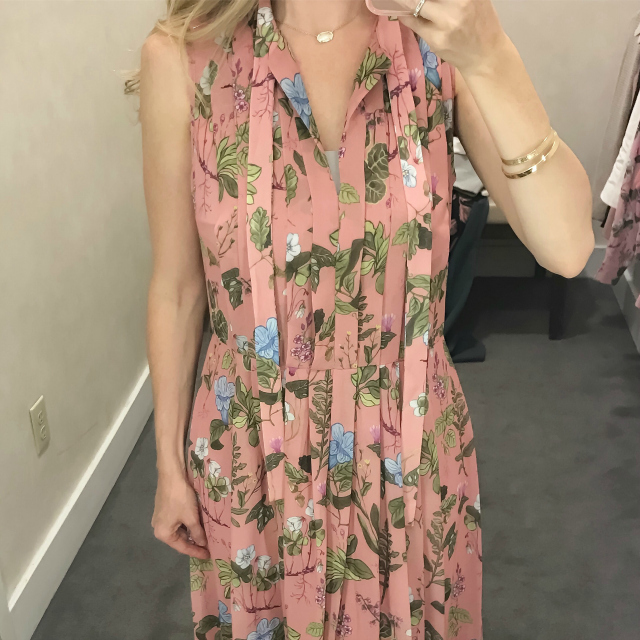 This dress seems to be selling like hot cakes, and I can see why - it's simply beautiful! 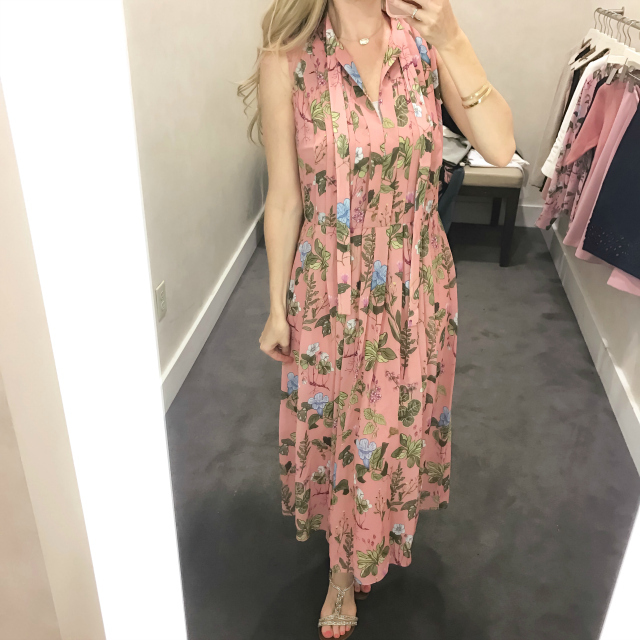 Several sizes are already sold out online, but you can always try to locate your size in-store by using the "Find in Store" feature on the product page or by calling Ann Taylor's Customer Service line. Fit: Runs large - recommend sizing down 1 - 2 sizes. Next is this Cropped Knit Tweed Jacket in size XXSP. This jacket has such a classic design with its thick, almost-tweed-like fabric and fringe detail. The open styling and collarless neckline are very sleek and streamlined. The two front pockets are a nice touch as well, and overall, this jacket is very reminiscent of Chanel. The only downside for me was that the fabric was too scratchy and itchy. This is always a deal-breaker, and in this case, I didn't want to be forced to layer a long-sleeved blouse underneath for the sole purpose of alleviating this issue. The fabric is a cotton-polyester blend, which I wouldn't normally associate with an itchy material, but for some reason, the feel of this jacket bothered me the moment I put it on. Unfortunately, it was a pass for me. That said, it could be that my skin is just extra sensitive. I would suggest trying this one on in-person before buying just to be sure. 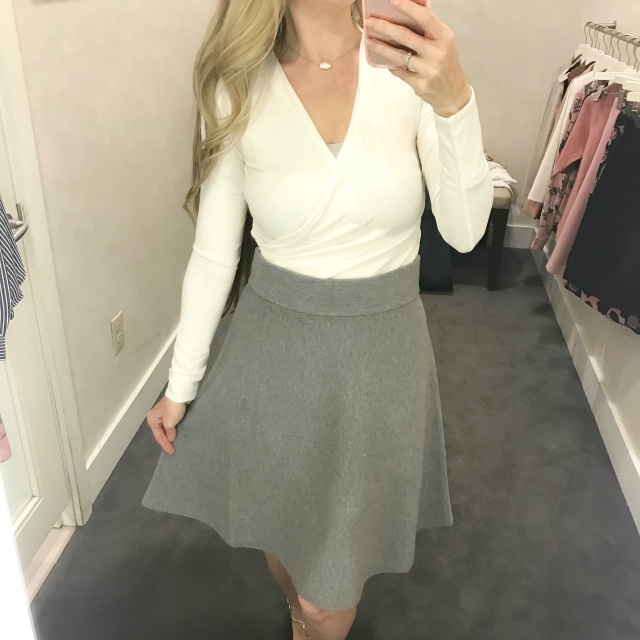 I grabbed this light grey pencil skirt from the rack to try on with these pieces, and didn't realize until now that it's no longer available online. It appears to have sold out, and I didn't jot down the style number for reference. (*face palm*) The Petite Textured Jacket looks like the matching jacket, if you like the exact color and pattern of the skirt. 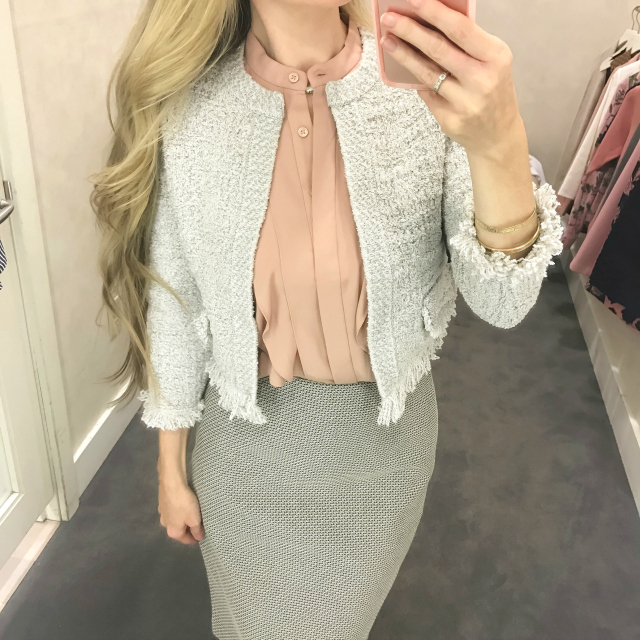 A couple of similar pencil skirt alternatives I found online are the Bonded Knit Pencil Skirt and the Marled Pencil Skirt. Both are nice, basic pencil skirts with textured fabric to add interest. I wasn't able to try these on, so I can't speak to their fit, but I wanted to mention them in case you're in need of a grey, textured pencil skirt. Next is this Single-Button Blazer in "vintage petal" or blush-pink in size 0P. I was surprised to find this blazer in-store since the petite sizes of this particular colorway are completely sold out online. This means you may still be able to snag one if you use the "Find in Store" feature or if you call Customer Service, as I mentioned above. The size 0P was the smallest available to try on, so I grabbed it to give it a try. 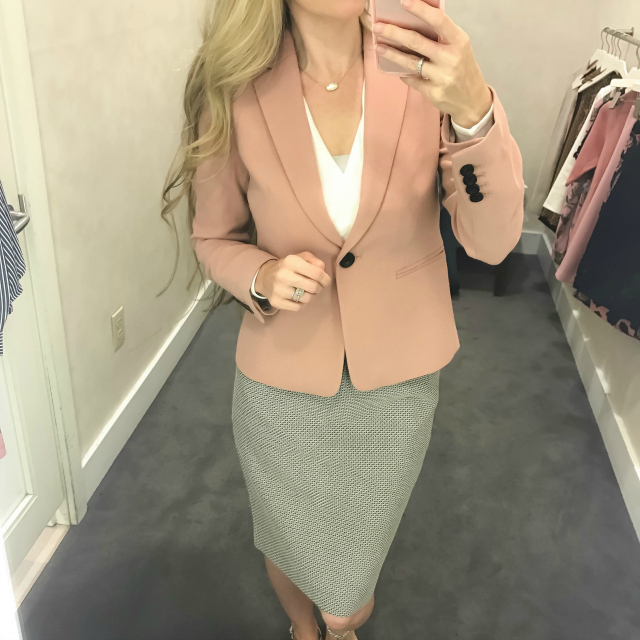 I love a classic, nice-fitting blazer, and this one in blush-pink is no exception. The color is beautiful, and the blazer itself is soft and feminine without being overly frilly. It also comes in an ivory-white color. It's fully lined and has a nice weight to it. I highly recommend it. The pencil skirt shown is the same one referenced above. Next I tried this navy-blue, eyelet-trim sweater combo. Once I got it on, though, I thought it was quite pretty. I tucked the top into the skirt for more coverage and for a flattering silhouette. Important note: the trim along the bottom of the sweater shows your belly button! A matching cami will need to be worn underneath for more coverage if wearing it untucked, or the trim will need to be tucked in as it is here. Sizing up for length may help, but I ran out of time to test this theory. I like that both pieces can be mixed and matched (I'll show you an example below) and that they're offered in regular and petite sizing. The top also comes in "winter white," which is an online-exclusive colorway. Overall, I liked this set and would recommend. 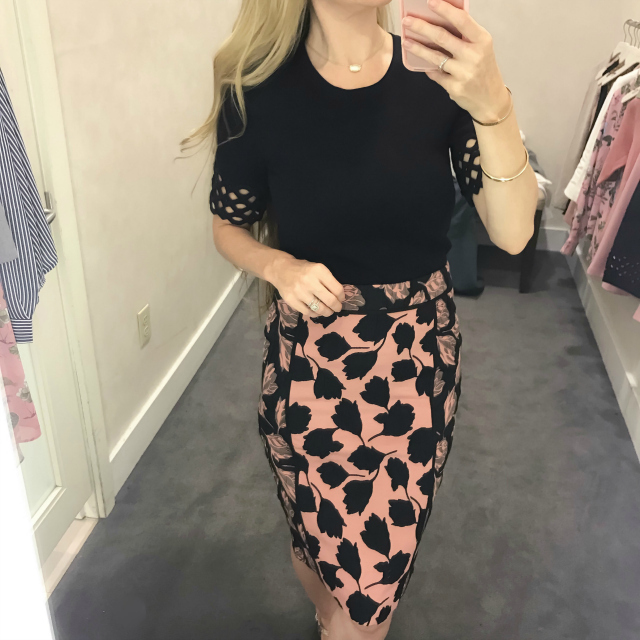 To break up the above set, I swapped out the sweater skirt for this Tulip Jacquard Pencil Skirt. The tulip pattern with the contrasting navy and mauve side panels and black piping is so unique and beautiful! I hadn't even noticed this skirt online, but once I saw it in-store, I had to try it on. This skirt is definitely a show-stopper, and you are sure to get noticed in it. I highly recommend it. Next I tried on this grey Sweater Skirt in size S.
It's simple yet so darling! 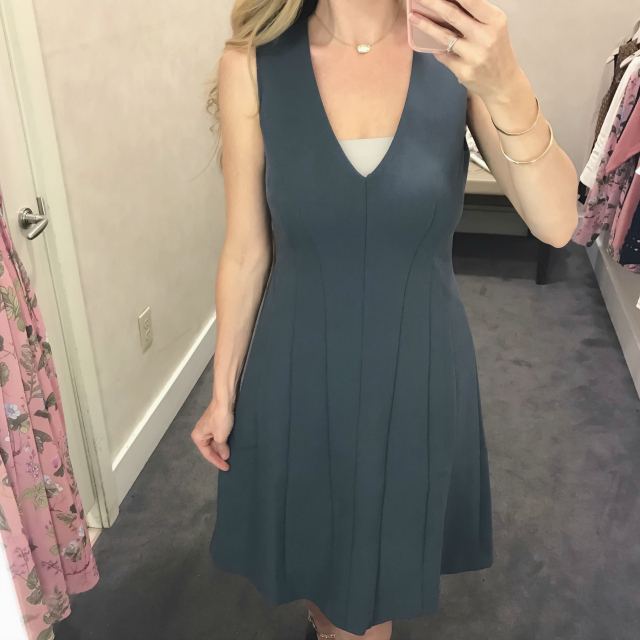 The light grey color is a perfect neutral for Fall (and year-round) and the flared silhouette is very flattering. Since it's a sweater skirt, I sized up, and I'm glad I did; the Small fit nicely, skimming the hips without clinging. The length was just right, too, hitting right at the knees. The great news is that this skirt is offered in regular, petite, and tall sizing -- yay for options! I can see this being dressed up or down with sweaters, blouses, or tanks -- it's super versatile. Love it and highly recommend it! The white wrap blouse is the same one mentioned above. Next up was this navy and white Striped Ruffle Neck Blouse in size XSP. This one was another pleasant surprise. I hadn't even noticed it online, yet it caught my eye in-store. The navy, micro stripes and ruffled-neck detailing is what sold me on it. The covered button-down front is a nice touch, too; it gives it a clean, sleek look. The material feels soft and silky, and doesn't look wrinkle-prone -- always a plus. Size XSP draped nicely and didn't gape at the bust. The sleeves are just a smidge long, but not enough to deter me. I love it and highly recommend it! I paired the blouse with this soft pink Textured Twill Flounce Skirt in size SP. Of course, I adore the color, and the flounced hem is feminine and pretty. The A-line silhouette is also super flattering. The material has some stretch to it and feels similar to the grey sweater skirt I tried on earlier. For this reason, I sized up to a Small Petite, and it fit nicely -- not too loose and not too snug. I can still eat my tacos without worry. ;-) The length hits right at the knee, too, which is ideal. Dressed up or dressed down, this is another lovely classic to add to your skirt collection. Highly recommend it! Last but not least, I tried on this Doublecloth Seamed Flare Dress in size 4 regular. I hadn't intended to try this one, but once I did, I really liked it! The color is a bluish-grey, which is a great color for Fall, and certainly unique; I don't come across this color too often. If this color is not your cup of tea, then it also comes in a classic-chic black. The smallest size in-store was a 4 regular, but I slipped it on anyway and was surprised at how flattering it was. I'm guessing this dress runs fairly small, as I'm usually in a size 00 or 0 for these types of dresses. The cut and seaming is what makes this dress special. It really highlights the narrowest part of your waist and gently flares out at the hips. It's very elegant and ladylike. Dress it up with pearls or a crystal statement necklace, classic pumps and a clutch, and you've got the perfect dinner party ensemble. It's also very comfortable. It's fully lined and has a concealed zipper in the back, making it easy to slip in and out of. No weird contortions needed with this one. (lol) It's really lovely and I highly recommend it. I hope you found these reviews helpful! If you have any questions, I'll be happy to help. Have you been eyeing any of these? Which are your favorites?